If you're a lover of all games card-related – blackjack or poker perhaps – you've probably also tried your hand (pun intended) at a few tricks. Or certainly thought about it. Wowing your fellow poker players with a few flashy shuffling techniques is a nice bonus skill to have, but it can take months to reach the levels of fluidity and skill that professional casino dealers possess. There are a number of card tricks, on the other hand, that are surprisingly simple to learn and execute. As with most magical things, it's often a matter of careful setup, deception and lots of practice. Here are two tricks that are simple to pick up but easy to wow with! Take your cards and shuffle them. Let your audience have a shuffle too if they like, so they're convinced there's nothing rigged. At some point, make sure you take a mental note of the card on the bottom of the pack (Ace of Spades, for this example). A subtle glance while you shuffle the pack is essential, so make sure you do this after you're given the cards to the audience (or just keep hold of them). The main thrust of this trick is making your audience feel like they're in control. Now, skim through the cards. Make sure the deck is held face down. Get someone to stop you as you skim through, as it reinforces the idea that you're not in control of the trick. Secondly, when you've been stopped, it's easier to get in position to move the bottom card, the Ace of Spades in this case, with your fingers. For the final step, you need to carefully slide both the top and bottom cards from the pack at the same time. The simplest way to do this is by using your thumb and index finger to remove the top card, whilst using your middle finger on the bottom of the deck (along with your other hand) to slide the bottom card out at the same time. 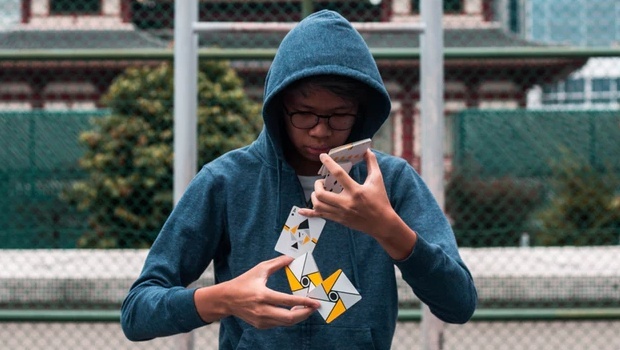 With practice, you'll be able to get both the top and bottom cards out at the same time without being noticed. State the bottom card is the Ace of Spades (or whatever it is) and reveal it from the bottom of the pack to amaze your group. This is a time-tested classic and it never fails to impress. Get someone to choose a card, then find their card in a shuffled deck immediately. Not only is this one almost certain to elicit a gasp from your guests, it's deceptively simple to master. It also combines all the essential elements of a card trick – quick hands and misdirection. It also requires you to learn some simple sleight of hand skills, which are handy for card tricks in general. Ask someone to choose a card. Make sure everyone sees the card. Put the card and the deck behind your back, and slip the chosen card directly beneath the top card in the deck while they're behind your back. Reveal the deck again and take the two top cards off as one (this might take a bit of practice). The bottom of the two should be the chosen card. Ask your rapt crowd if this is their card, which of course, it is. Now, move the very top card and shuffle it into the pack. This is the trick card, because the actual chosen card will now be at the top of the deck thanks to your earlier skills. Shuffle the deck as much or as little as you like. Invoke the mystical powers of Cthulhu, wave your hands chanting abracadabra, or simply state you've moved the chosen card to the top – anything you like to increase the wow factor and showmanship. Reveal the top card, which will be the one the audience chose and enjoy their reaction. So, there you have it. A couple of show-stopping tricks that you should be able to master quite quickly. If you're considering performing at weddings and children's parties as well as poker games, then they're a great place to start.